What ever happened to cute, independent shops filled with charm and one-of-a-kind gifts? We found 55 of them right in your backyard. So put down that chain-store circular and get ready to love holiday shopping again. This super kid-friendly shop keeps kids’ titles together on one rack (and away from racier comics). Very young readers go for Tiny Titans, an adorable monthly ($2.50 per comic), while middle-schoolers choose between digests of Super Friends ($13) and manga-style Nancy Drew and Hardy Boys ($8). Gift certificates can be redeemed for weekly Magic: the Gathering tourneys ($5–$15 entry fee), which draw a range of ages for the games and gratis snacks. 6928 N Glenwood Ave (773-338-0899). With an eye-popping array of outfits and accessories, Lost Eras is on a mission to get everyone in Chicago to play dress-up. Most of the sizes here are for adults, but kids of any age can get decked out in feather boas spanning the color spectrum ($6–$40) and sunglasses that range from Blues Brothers cool ($4) to Elton John glitter ($9). Older kids will love hot pink, striped and leopard-print tights ($5–$10) and synthetic “leather” jackets ($20). Gag gifts such as disappearing ink ($2.50) are surefire pleasers, too. 1511 W Howard St (773-764-7400). Harry Potter’s been good to this family-owned store, which happens to sit on a diagonal alley, but its best assets are the genial shopkeepers, who happily perform tricks (and reveal secrets with hands-on lessons when you buy). Royal Magic kits get rookie magicians started with gimmicks like coin tricks ($25; with instructional DVD $40), while the “magician’s staple” Svengali Deck ($10–$12) helps them “predict” chosen cards. Kids also will love the magic coloring book ($7–$10), with drawings that disappear or colorize with the wave of an accompanying wand. 5082 N Lincoln Ave (773-334-2855). Chicago’s go-to spot for everything from mezuzahs to stuffed matzo-ball dog toys has been around for more than six decades. Besides plenty of modern and traditional Jewish children’s books and music, you’ll find goodies like the Magnetic Poetry Hebrew Alphabet Kit ($17), which should keep little ones busy playing on the fridge door. For Hanukkah, try the KidKraft wooden play set (31 pieces, including dreidel, latkes and menorah, $40) or, for real candles, an adorable Noah’s Ark menorah ($45). 2906 W Devon Ave (773-262-1700). When she bought the Sweden Shop four years ago, Patti Rasmussen expanded the Scandinavian- and German-focused gift store with a charming kids’ section. Sweet-as-can-be imports include hand-carved Ostheimer animal figurines that are painted with nontoxic dyes (ranging from baby chicks, $7, to a big moose, $29) and one-of-a-kind Herzenart Viking pillow toys ($138). All this, plus pint-sized clogs (starting at Euro size 32, $56)! 3304 W Foster Ave (773-478-0327). Don’t plan to buy a Nintendo DS here. 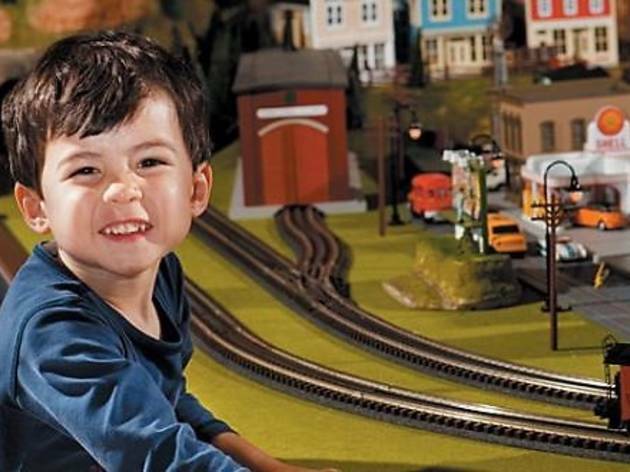 Priding itself on carrying virtually no electronics, this suburban toy shop with locations in Evanston and Glenview likes to go the imagination route. You’ll find Calico Critters animal families ($8 to $200), Bruder toy recycling and cement trucks (from $36), and Sprig playsets made with recyclable materials ($30). 620 Grove St, Evanston (847-492-1030); 1462 Waukegan Rd, Glenview (847-729-8850). Pinocchio would be proud. 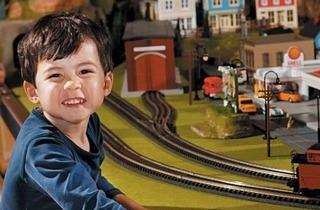 Bright, fun, old-world-style wooden toys fill this charming Oak Park shop. Presenting itself as an alternative to stores that stock all manner of battery-powered gizmos, GTB peddles Thomas the Tank Engine train sets (from $40) alongside wooden trucks from Fagus ($64 to $210) and hand-carved stained blocks that can be stacked to form rainbow-flower shapes ($30 to $85) from Grimm’s Spiel & Holz of Germany. Shoppers receive complimentary gift wrapping and can stash purchases at the shop until Christmas Eve for free. 730 Lake St, Oak Park (708-445-9906). Beyond the extensive Japanese grocery store and mouth-watering food court, this Arlington Heights shopping mall boasts the kind of ethnic treasures you’d expect to find in the Tokyo airport. You’ll have no trouble finding Japanese-language versions of periodicals, manga novels or children’s classics like Eric Carle’s Slowly, Slowly, Slowly, Said the Sloth, but the bookstore also boasts fantastic origami kits ($14.95) with English instructions for making paper boa constrictors, scorpions, piranhas and more. Tired of LEGOs? Let your kids build sharks, dinosaurs and helicopters from unique LaQ Japanese building-block sets ($14 and up). While you’re there, pick up some stocking stuffers from the unusual collection of toy vending machines and the expansive candy section. 100 E Algonquin Rd, Arlington Heights (847-956-6699). Parents love both locations of this family-owned toy shop as much as kids do, thanks to their carefully edited toy selection (everything’s pre-tested by buyers) and preferred customer program (so all those birthday presents you buy add up to something). Opt for imagination-inspiring crafts like Creativity for Kids’ Racer Bike kit ($20) that lets little ones customize their rides with metallic paints and stickers. If you can’t leave the little darlings at home while you holiday shop, take advantage of the store’s “elf shelf,” where toys can be held until December 24 so you can find another time to secretly pick them up, all gift-wrapped and ready to put under the tree. 5137 Main St, Downers Grove (630-493-1400); 123 N York St, Elmhurst (630-279-0011). If you can’t go another holiday season without a $2.50 whoopee cushion, this Oak Park shop is for you. Gag gifts are ready and waiting along with clever stocking stuffers such as collectible Iwako Japanese erasers ($1) and retro car and robot windup toys ($3–$40). Kids and parents alike may gravitate toward the old-school Beatles and Wizard of Oz lunch boxes ($10–$16) and Superman or Batman shirts that come in both children’s and adult sizes ($14–$25). 1028 North Blvd, Oak Park (708- 524-8144). Boasting 9,000 different products, Toynk is a kid’s and collector’s dream come true. The nine-year-old Bensenville-based company conducts most of its business online and specializes in those hard-to-find favorites, ranging from standard $5 Transformers to the Japanese versions and collectibles including a $500 Optimus Prime statue. (Time Out Chicago Kids readers who enter the code TOCKids on Toynk’s website receive 10 percent off all purchases.) Still, it’s worth a trip to the filled-to-the-gills, 2,500-square-foot retail space, where owners predict a mad holiday rush for the Star Wars Force Trainer ($119), Super Mario five-inch vinyl figures (set of five, $45) and the Back to the Future Delorean replica Mark I Car ($41). 2371 United Lane, Elk Grove Village (847-350-0108). Before boutique toy shops and strip-mall megastores with giraffe mascots dominated the toy scene, there were stores all over Chicago like no-frills Cut-Rate. An Edgebrook mainstay since the 1950s, it has outlasted them all by offering bargain-hunters deals on Thomas & Friends (25 percent off list price), Brio (20 percent off) and educational toys. There’s a wide selection of LEGO products, ranging from $9–$100, as well as plenty of small treats perfect for goody bags. A weekly flyer (available online) highlights especially-deep discounts. 5409 W Devon Ave (773-763-5740). This museum-like space is geared toward serious doll collectors looking for treasures by Madame Alexander, Middleton and other big-name designers, but there’s plenty here for little and big lovers of dolls and stuffed animals alike. Grandmotherly shopkeepers lovingly tend to doll repairs, but they’re also helpful and happy to hand out Tootsie Rolls to young shoppers. There’s an awesome selection of interactive plush Webkinz ($9–$12) , clothes and accessories for American Girl dolls ($8–$22.50), and Barbies for $5 and up. You’ll also find plenty of tiny dollhouse accoutrements and collectible toy Re-Ment miniature foods starting at $5. 6029 N Northwest Hwy (773-594-1540). Chicago’s only kite-centric retailer stocks more than 400 varieties to match just about everyone’s whims and skill sets. The staff advises beginning fliers to try one of the delta-style animal kites ($15), which don’t require running to keep them airborne. Little artistes might dig a color-it-yourself kite ($6). There’s a good stock of Frisbees and boomerangs, too, as well as juggling gear (a set of balls for $8 and clubs for $35) for your budding circus star. 5445 N Harlem Ave (773-467-1428). Bellybum offers how-to instruction along with a wide range of cloth diapers, from off-white cotton ($1.50 each) to organic cotton, bamboo and hemp inners with designer outers ($35). Peek-a-Belly onesies ($30) allow quick access for some loving raspberries on baby’s tummy. And the wide-brimmed MoBoleez breast-feeding bonnet ($40) fits snugly on baby’s head, providing modesty without having to drape a cloth over baby and mom. 4347 N Lincoln Ave (773-868-0944). The 11,500-square-foot official store of the Chicago Fire and Chicago Red Stars is also the go-to place for independent soccer leagues, school teams and just about anyone looking for gear to play the game. Buy little fans jerseys for teams from around the globe such as Manchester United and Inter Milan (from $40), a FIFA Fever highlights DVD ($50), or a Puma King Italia limited-edition ball with signatures from team players ($100). Looking to really splurge? Book a travel package through the store to the 2010 World Cup in South Africa. There are smaller, but equally well-stocked, outposts in Melrose Park and Cicero, too. 4839 N Western Ave (773-271-2255). The gift shop at the front of this Ravenswood studio carries a small but nifty selection of creativity-fostering gifts. Whimsical “paper machines” (build-it-yourself models that move when you turn a crank) include robot and penguin designs ($8–$10). Doodles for Dinner encourages young kids to draw everything from trucks to meerkats on nifty paper place mats ($11 for 36), while older kids can use the Pocket Paper Engineer, a sturdy spiral-bound guidebook, to create their own pop-up book ($24–$27). Gift certificates can also be used for classes for budding artists. 4401 N Ravenswood Ave (773-769-4226). The inventory of environmentally gentle products here includes German-made Natursutten pacifiers ($6.50) and teethers ($12), which use only natural latex from rubber trees. Same goes for the Original Rubber Duck ($6.50), a nontoxic, hand-painted squeaky bath toy. A highlight among the large clothing selection are shirts custom-made by employee Faith Abra, who sews letters from vintage shirts onto organic cotton tees ($30). 4654 N Rockwell Ave (773-505-2066). Personalized kids’ gifts are a specialty at this warm and friendly shop, though (bonus!) you’re likely to score finds for grown-ups on your list, too. Lovies put a plush animal head atop a supersoft blanket. We heart the monkey, but it’s got bunnies and lambs, too ($28, with baby’s name added in two to three days $36). Twelve Timbers wood photo frames can be personalized while you wait ($26 plus $3 per letter). Or grab a must for parents of infant boys: Pee-Pee Teepees, washable cotton covers to reduce firehose action during diaper changes ($10.50). 4612 N Lincoln Ave (773-334-6900). Where did your childhood toys go when they died? To the heaven called Quake, a collectibles shop jam-packed with vintage toys, comics and lunch boxes. The inventory is random (owner David Gutterman buys everything used, although much is still in its original packaging), yet you’re guaranteed some Star Wars scores (Darth Vader with Tie Fighter, $7) along with Simpsons and superhero sundries. Vintage lunch boxes range from $30 (The Incredible Hulk) to $125 (The Brady Bunch). Gift certificates let little collectors pick their own treats. 4628 N Lincoln Ave (773-878-4288). Kids will be hard-pressed to decide where to run to first in this charming neighborhood shop. A puppet display is stocked with cuddly Folkmanis animals and inventive Make Your Own Monster puppets ($25), which come with a hilarious array of fun fur, plush horns, eyes and teeth. The costume corner calls to nascent astronauts, princesses and anyone who needs a sparkly foam sword ($13). Little engineers love to test Quadrilla, a nifty build-it-yourself chiming system of wooden planks and levers for marbles (melody basic set, $80). 4749 N Lincoln Ave (773-334-4445). This haven for Asian knickknacks sits right at the gateway to Chinatown. The glut of Hello Kitty merch includes a six-foot-long “curtain” with plastic Kittys instead of beads ($13). Soooo many plush dolls, but we’re smitten with Kuromi, Kitty’s goth girlfriend ($13–$25, size varies). A tiny Winnie-the-Pooh cell-phone purse makes a cute, easy-on-the wallet toddler gift ($3). Don’t miss the wide selection of gorgeous Chinese robes, tucked in back. 2212 S Wentworth Ave (312-225-0088). This bright and friendly nonprofit gift shop supports Chicago Association for Retarded Citizens. One side of the store is dedicated to kid and baby gifts, the other to grown-up treasures. Check out the adorable Fuzz That Wuzz stuffed animals, made from recycled plastic bottles ($15–$44). And, for the littlest ones, swoon over the cute-as-a-button felt animal skullcaps ($10). 1814 W 103rd St (773-239-5619). If Godzilla’s your kid’s thing, then Bridgeport’s your destination: Monster Island could practically bury Tokyo with fire-breathing beast paraphernalia. Highlights include Mechagodzilla (that’s silver robot Godzilla for the uninitiated, $30) and Godzilla 2000 (dark green with purple fins, $20). For teaching Junior how to tell time, try the Godzilla and Mothra wall clocks ($25). Our favorite non-lizard item is the plush Transforming Werewolf ($29.99), which morphs from lumberjack to fanged creature. 3335 S Halsted St (773-247-5733). You’ll find loads more than blocks at these neighborhood hot spots (a second location recently opened in Wicker Park), jam-packed with nearly every type of toy you can imagine. Stuffed animals, dolls, building sets, science kits, toy trains, puppets, games, books, outdoor toys—it’s all here. Hatch your own beautiful pets and study their life cycles with the Live Butterfly Pavilion from Insect Lore ($30). Older ones will love cooking up mold and germs with Disgusting Science kits ($21). 3306 N Lincoln Ave (773-525-6200). The helpful staff is glad to guide in-the-dark grown-ups to age-appropriate comics for kids, and the shop stocks loads of comic-themed goodies, including Superman, Batman and Green Lantern T-shirts in kids’ sizes ($16) and “how to” write or draw comics guides from both Marvel ($17) and DC ($22–$23). But Chicago Comics’ biggest sellers for kids are Uglydolls: the original plushies ($20–$25), and a key chain ($6), which rumor has it First Kid Sasha Obama sports on her backpack. 3244 N Clark St (773-528-1983). There’s an emphasis on local authors and foreign titles at this fun retail space. Check out the Usbourne lift-the-flap books and Geronimo Stilton chapter books, as well as a vast selection of works from local authors. Show your creative side with do-it-yourself craft kits for picture frames, piggy banks and other items ($7–$20) or spice up a room with Handmade By Lindsay wall hangings, featuring your favorite child’s initials or full name ($40). Post-holidays, visit the shop for daily storytimes (various age groups; check the site for details). 3453 N Southport Ave (773-472-6657). The force is with gamers at this eclectic space. Get in some pre-shopping playtime on Xbox or Wii for $5 per hour, then pick up an old-school metal Transformers action figure ($50) to show your kid how you played back in the day. Or find a board game the whole family will dig, such as the überpopular Settlers of Catan ($43) or the Monsterpocalypse series (starter set, $25). 3240 N Clark St (773-697-7751). The tiny brick-and-mortar outpost of everyone’s favorite eco-baby website stocks a well-edited selection of organic, sustainable and stylish children’s goods. You’ll find adorable toddler-sized aprons from Mimi the Sardine ($15), an array of cloth-diapering accessories and sturdy, chemical-free wooden toys such as artful, intricate Lindenwood alphabet blocks in Hebrew, French and Spanish ($37). 3125 N Broadway (773-525-4030). Retro-video-game lovers can get their Atari on at this Lakeview favorite, which also stocks most other vintage and state-of-the-art systems. The store specializes in preplayed games, ranging from 95 cents to more than $100 for superrare titles such as Bubble Bobble 2. Gamers get store credit or cash for trading in games and systems. All items are cleaned and tested before being sold. 3268 N Clark St (773-883-8813). You don’t have to be a kid in a candy shop to be sucked into this delightful purveyor of sweets. Have the store put together a gift basket ($25–$50) of old-timey treats (Fun Dip, candy buttons, wax soda bottles) and small toys, new-fangled sweets (Nerds Ropes, Sour Patch Kids) or classic all-ages pleasers (Chicago-made chocolate grahams, $2; and s’mores, $3.25). You know the store’s open when the giant fiberglass penguin’s standing outside. 3256 N Damen Ave (773-549-1706). This crazy madhouse of a shop is stocked to the gills with gag gifts, magic tricks, vintage tchotchkes—everything you need to stuff those stockings. Head to the library-esque card catalog, where each drawer is filled with something more bizarre (read: cool to kids) than the last. Where else could you buy a pooping pig ($1.50), a remote-control fart machine ($15) or a pack of seven fake mustaches ($5)? And who doesn’t need a windup walking brain ($3)? Superhelpful employees make it easy to find what you need—or what you never knew you needed. 1338 W Belmont Ave (773-477-8223). If thoughts of ruffled, plaid baby gear turn your stomach, head to Hadley, the home of modern-design-driven baby furniture, gear and goodies. Beyond streamlined sets for the nursery, you’ll find fun room decor and toys for the toddlin’ crew, such as Italian-made bear or elephant-shaped Zoo Lights lamps ($82), ecofriendly construction vehicles from Plan Toys ($65–$85) and an indoor-outdoor Vitra elephant that can be used as a chair, table or toy ($290). 1205 W Webster Ave (773-883-0077). Bargain seekers, mark your calendars. December 5 is opening day for the Lincoln Park outpost of this upscale children’s resale boutique’s holiday toy extravaganza, when choice toys (some of which are unopened) go on sale. In the past, lucky shoppers have landed American Girl dolls for $20, Brio train sets for $50, and wooden rocking horses for $25. Did we mention kid-size North Face puffers and designer denim at a fraction of the cost? 954 W Armitage Ave (773-883-0880). Leave it to Lincoln Park Zoo to take stuffed animals to the next level. The Wild Things! gift shop lets you customize the coat of your own cuddly Animaland critters ($17), which come with an authenticity certificate, wishing star and carrying case. Buy the Jane Goodall Roots & Shoots red panda clay animal miniatures ($13) and a portion of your purchase goes to animal conservation efforts. 2234 N Cannon Dr (312-742-2000). The name pretty much says it all. If you’re in the market for a big toy, one of those wowie-zowie-look-what-Santa-brought treats for under the tree, this is a one-stop shop. The store sells large plastic toys made mostly by Step 2, such as sand and water tables ($80) and climbing structures ($100 and up). Need a snazzy toy kitchen that’ll rival the ones in new-construction Lakeview condos? They’ve got ’em here, ranging from $100–$240. If you don’t see what you want, order from the expanded catalog and have it shipped to the store at no extra cost. 2319 N Damen Ave (773-687-9080). Pssst. Here’s a secret: The Boring Store’s not boring at all. It’s one of the “secret” shops around the country founded by novelist Dave Eggers to fund nonprofit writing and tutoring centers. A drop-in tutoring and workshop area sits at the back, but in the front you’ll find an array of gear including Rearview Sunglasses ($10) so young spies-in-training can see who’s lurking behind them, and a UV Spy Pen ($10), which allows them to write secret messages and “decode” them with an attached blacklight. 1331 N Milwaukee Ave (773-772-8108). Looking to get the family away from those glowing screens to sit down and have fun together? With shelf after shelf of games and puzzles for the littlest tots up to the most hard-core strategy gamers, this year-old store may hold the key. Check out the Jungle Speed card game ($20) or test your skill on some incredible Rubik’s Cube spin-offs, like the 5” x 5” cube ($30). 2212 W Armitage Ave (773-384-4454). Ever wonder where teachers get the doodads to decorate those school-hallway bulletin boards? Here! But there are also plenty of great gift finds, too. Score craft supplies galore, including multicultural construction paper in a variety of skin tones ($4.75/50 sheets), or pick from an impressive selection of educational games, such as Initial Consonants Bingo ($10). Added bonus: All the employees are teachers, so they can steer you in the most age-appropriate direction. 1855 N Milwaukee Ave (773-252-8200). Maybe Mom wouldn’t have been so quick to buy us Toughskins at Sears if there had been a hip neighborhood shop like this one when we were growing up. The superhelpful staff can help you choose among designer duds from Appaman and One Love, or a selection of teeny tiny Vans ($32–34). Superhero capes ($17–$31) are perfect for preschoolers with a penchant for dress-up. The store has an awesome website with an expanded inventory, too. 1630 N Damen Ave (773-772-2815). “I have more toys than your kids,” reads the T-shirt displayed near the front of this mecca of bright-colored vinyl collectible figures from designers around the world. Sure, there are some paycheck-busting figures for serious collectors. But there are plenty of less-expensive treats, too, like the blind-box toys (a surprise in each one!) for $6–$8. The store’s name combines “roto-casting” (a process of vinyl-toy making) with “Fugi” the owner’s beagle/shih tzu. Just stepping into this funhouse of colors and textures is like stepping into an art gallery of childhood. 1953 W Chicago Ave (312-491-9501). One-up your eco-maniacal friends with superfun and environmentally aware finds from this bamboo-floored Andersonville boutique. Try Miss Brittany’s Organic Preschool Fun Dough ($30), the fair-trade Playful World hand-knit wool animals ($40) and an Educo wood play kitchen ($120), a 42-inch set with plates, utensils and food that’s compact enough for city dwellers. Don’t miss too-cute cotton onesies and tees by local designer Pluto ($26–$28). To keep the green going, employees wrap gifts in complimentary recycled tissue tied with biodegradable cotton ribbon. 5111 N Clark St (773-944-9250). Multitasking moms, take note: This hip children’s boutique with locations in Andersonville and Bucktown can serve as a one-stop shop for cute clothes (ages newborn–12) and creative toys and books. We especially like Sandy Vohr’s handmade leather bookends shaped like elephants, giraffes and robots ($192); a North American Bear Co. DIY doll kit, with washable markers to color her face and dress ($32); and build-your-own ecofriendly spaceship or pirate ship kits from the Little Experience ($24). After-hours shoppers can buy online and pick up at the store later. 5407 N Clark St (773-989-8500); 2060 N Damen Ave (773-489-9800). This Chicago mini chain (there are also locations in Lincoln Park, Hyde Park and Evanston) sells toys and games with an educational bent that don’t skimp on fun. Obama mamas will love limited-edition Barack Obama Air Force One wooden planes ($18) for their tots. For tiny dancers, buy the Ballerina in a Box ($25), a tidy cube containing four stand-up ballerina dolls, reusable sticker accessories, a mirror and fold-out trellis. All locations offer free gift wrap for everything from tiny board books to towering dinosaurs. 5311 N Clark St (773-769-5311). Galt is so jammed with toys and trikes, strollers and stickers, crafts and cars that it’s hard to imagine any kid leaving the Michigan Avenue or Northbrook outposts without a shopping bag or a lengthy wish list. Hot holiday items include a Snap Circuits electronic project set ($65), with which mini inventors can create motion detectors, and Chicco Billy Funwheels ($45), a car operated with a remote steering wheel, Wii-style ($45). Free gift wrapping. 900 N Michigan Ave (312-440-9550); 2020 Northbrook Ct, Northbrook (847-498-4660).